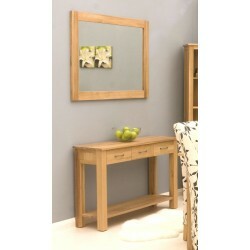 Superb contemporary tall, narrow oak bookcase The width of this piece means that it is the per.. Solid oak CD and DVD cabinet Height 129 x Width 49 x Depth 21 cm Can take approx 190 CDs.. Superb contemporary oak dining table Seats four people The dimensions are H80 x W120 x D..